April 11, 2019 | -by: Kevin George. Want to sell your services or, draw attention of your target audience towards a new product or service that you are about to launch? Email marketing is your best bet! It gives you an opportunity to connect with the people directly and increase the likelihood of converting them. Most people believe that email marketing is an excellent channel for the B2C niche alone. That’s where you are mistaken. It is quite a popular way of reaching out in the B2B niche also. 93% of the B2B marketers use emails to distribute their content. However, you can see that not many B2B companies stand out in their email marketing campaigns. One of the biggest reasons being, they are not able to put in enough efforts into their emails. Secondly, creativity comes with a sort of restriction for the B2B email campaigns. Managing all the restrictions, and giving tough competition to the creativity showcased by the B2C email marketers, there are a few companies in the B2B niche that have stood out with their emails. Here, we have curated a few examples of B2B email marketing, which will help you redefine your email marketing campaign. Asana’s emails are always a delight to read. They see whitespace and color combinations in B2B marketing in a different light. This email is a perfect example of how you help your users with your products. 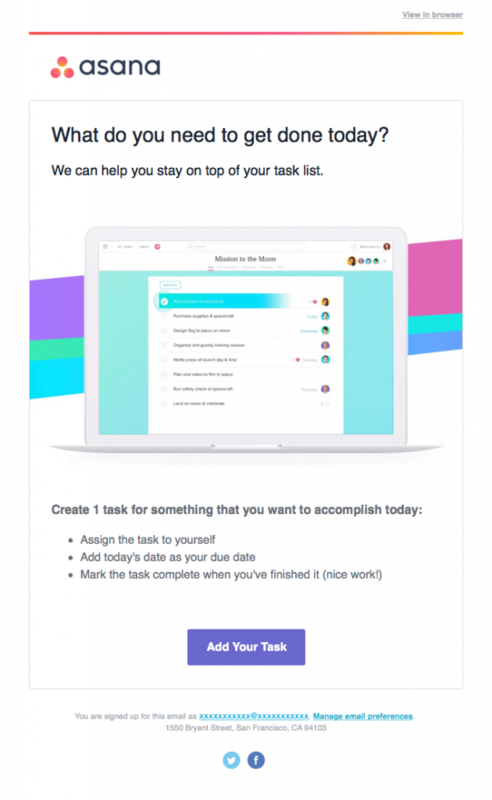 The email talks about how easy it is to use the Asana platform to communicate with your team and to manage the various projects you are handling. The email does not have too many graphics but, it still managers to capture attention. With minimal content and an eye grabbing CTA, they have undivided attention from the subscriber. This email can be a part of the welcome email series that you would send to your potential audience, calling them to sign up and use the product. How would you make a grand announcement, especially if you belong to the B2B niche? A lot of companies strive hard to compel their audience to get back with them, and use their products. However, most of them are not able to use email marketing’s potential to its fullest. Here is an example from Uber which will help reflect on your email marketing efforts, and help you understand what you can do better. Uber keeps it simple while announcing the new products or services they are planning to offer. With simple content flow and interesting images that explain how to use the new feature, the email helps the users understand what upgrades are to follow. Have you got a whitepaper that you believe will offer value to the target audience? Here’s how you can use email marketing to push the content and win over the audience. 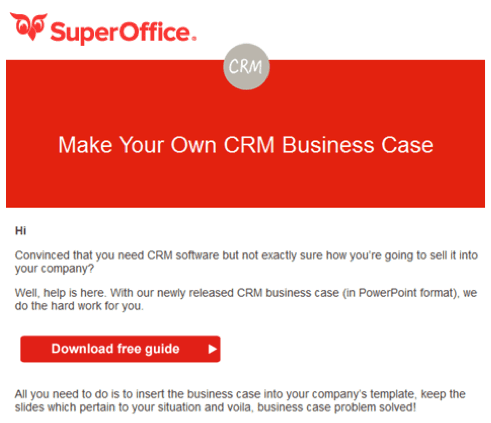 SuperOffice has added a crisp content that helps people understand what value they will get by downloading the whitepaper with a catchy subject line and equally attractive CTA. You should create valuable gated content that you believe will be useful, and send it via email for the best results. Your stakeholders would be interested in knowing what you have done in this year, and how much you have achieved. Not everyone can get an annual report published but, you can always summarize the beauty of your year in an email. Here’s an example of how Flywheel sent an email summarizing the year for their subscribers. Not every user on-board will behave in a similar fashion. Some will use your product extensively while, the others would not really be involved in the product. 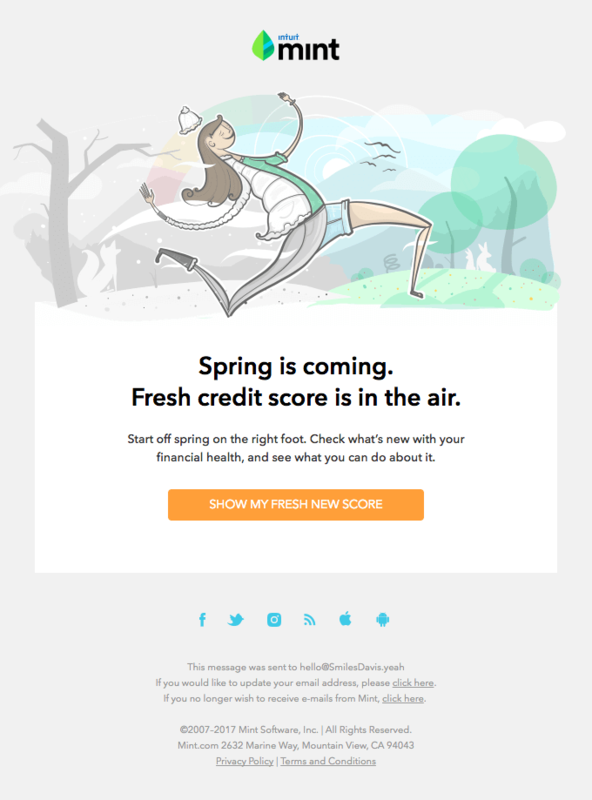 Mint, a credit score platform, sends in personalized emails to its subscribers, with a link that helps them check their credit scores. 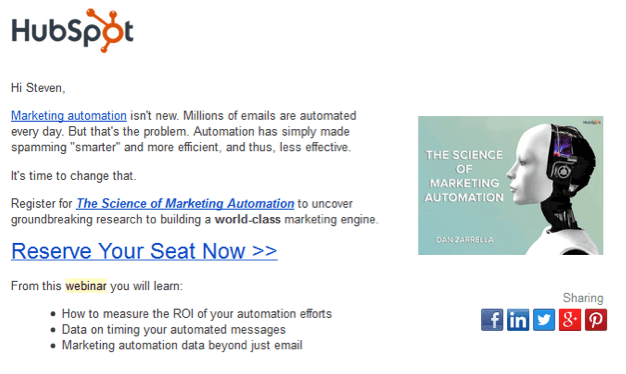 With minimal content and graphics that align with the email subject, Mint has got B2B email marketing right. Emails are an excellent way of getting support for your campaigns. Whether you are planning to increase traffic for your site or raise funds for some event, emails are a great way to gain the necessary support. Moo’s email campaign was set to gain more conversions for their products. They wanted people to know the premium value the company offers. In the campaign, the company has also shown how it cares for the user’s needs. They have used creativity, white space and colours in a restricted fashion, while keeping in mind the user’s needs. What is important to a marketer? The data! 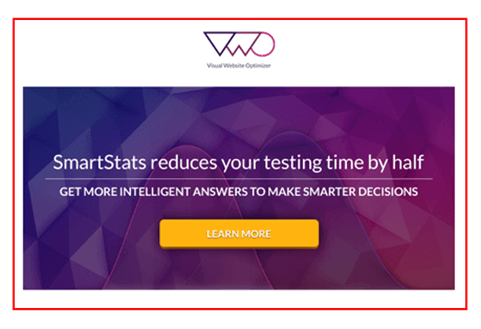 VWO had recently launched smartstats, which helped the users with analytics and insights. In order to help the users know about the new product, they decided to go ahead with an email marketing campaign. Simple and effective use of email communication can be seen in this promotional email. In case of the B2B niche, case study holds an important place. It helps the end user know what the company is capable of, and understands how they have worked out a similar solution in the past. 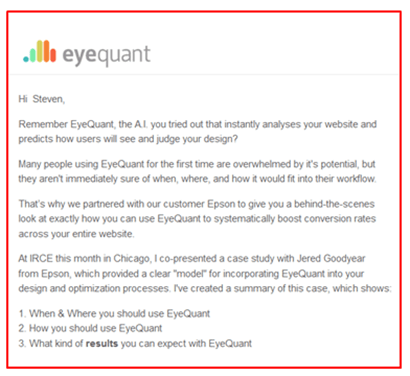 Eyequant made use of case study to attract the potential buyer and persuade them to convert. They did not claim they understood your problem; they talked about how they have already defined a solution for the same. This email definitely strikes a chord with their potential audience. Want people to attend your webinars? Well, the best way to do that would be connecting with your audience directly, and getting them to acknowledge the value you would offer through the webinar. HubSpot gives a sneak peek into what the audience can expect from the webinar and how useful it would be to them. It ends the email with a CTA that allows the user to book their seats. For the B2B audience, the biggest attraction is the demo. If you can offer a product demo, they are definitely interested. 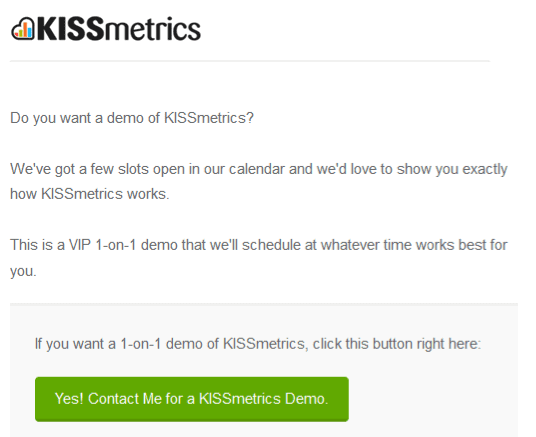 Kissmetrics sends a personalized email calling the potential audience for a demo. They make signing up for the demo easy, and set the expectations for the demo straight in the content itself. Email marketing is an excellent opportunity for conversion in a cost-effective way for the B2B companies. However, most companies mistake email marketing for a fancy way of connecting with the audience. That’s not true! Precise communication, simple email designs and an offer that adds value will help you increase your conversions. The idea is to offer snippets of information to the target audience, while keeping the emails simple and personal.